Fire protective clothing & types of fire suit. - Made from Kevlar fabric and stitched with Kevlar threads (finger type hand gloves). - With inside woolen & FR Fabric lining. - Heat resistance upto 550 deg.C continous working temperature and 850 deg short term working temperature. - Size : 12" to 22". - Made from aluminized glass fibre cloth with vapour / moisture / woolen / FR / heat resistance lining . - Double close front, Velcro fixing device and safety zipper. 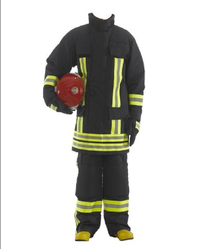 Our presented range of Fire Fighting Suit is broadly employed in the market for their durable nature. Due to their top features, these are enormously demanded in the market. We take a huge pleasure in the market by giving best and most elite quality assortments of Fire Safety Suit. 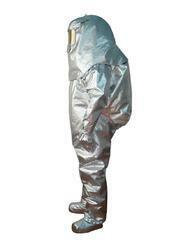 We are offering Aluminized Fire Proximity Suit to our client.